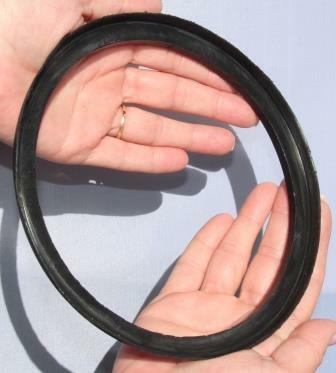 The Bevel-Sert isolation flange is made out of 3608/4710 NSF High Density Polyethylene (HDPE), a dielectric material. When used in Ductile Iron Pipe (DIP) applications, the Bevel-Sert acts as an insulator and a barrier to electrical current at each joint, promoting the existence of an electrically discontinuous pipe joint segment when the joint segment is bottomed out in the bell. The Bevel-Sert is designed to make infrastructure pipe joints electrically discontinuous, thereby reducing the corrosion rate and effectively extending the useful life of water and sewage pipes well beyond their current life expectancy. Independent test results show that use of the Bevel-Sert in DIP joints increases the resistivity across the joint and thus helps to reduce the potential for corrosion in pipelines. Without the Bevel-Sert, corrosion issues abound in metal pipes. That corrosion leads to a shorter life span for the pipes, resulting in increased costs for municipalities, which need to replace these pipes more often. According to the 2009 “Report Card for America’s Infrastructures” by the American Society of Civil Engineers, “New solutions are needed for what amounts to nearly $1 trillion in critical drinking water and wastewater investments over the next two decades.” Corrosion also translates to millions of gallons of wasted water – our most precious resource. Depending on location, the current replacement cost of an eight-inch water main can be as high as $180 per foot. The simple investment in the economical Bevel-Sert exponentially extends serviceable life of the pipe. This entry was posted in Phoenix, Arizona on April 19, 2013 by admin1.